A couple of years ago my wife had a minor accident, the kind that results in an older car being mysteriously “totaled.” Before the man came to ferry our 2005 Focus to the underworld, we put in a request. The CD player had a nasty habit of not surrendering discs when you pressed the “Eject” button. Could someone extract for us any CDs the player still contained? Our automotive Charon graciously complied, and salvaged two CDs. One, the name of which escapes me now, belonged to our son. The other was the Jayhawks’ Hollywood Town Hall, released in 1992. From the beginning, alt-country involved a tricky, paradoxical aesthetic. The music fiercely embraced the local and the regional, while trying to steer clear of parochialism. The tension permeates “Screen Door,” Uncle Tupelo’s ode to front-porch life. “Down here, where we’re at/ Everyone is equally poor,” rasps future indie superstar Jeff Tweedy. “Down here, we don’t care/ We don’t care what happens outside the screen door.” Alt-country albums featured photos of seedy diners, derelict filling stations, beat-up cars. The bleak, gritty imagery evoked a tough-minded realism, but veered easily into cliché, becoming as trite as a wheelbarrow under an apple tree. The Jayhawks wrestled with this ambivalence throughout their first four albums. After a debut of not-quite-straight-up country songs, with Mark Olson’s cracked vocals and cracked temperament in the foreground, they released Blue Earth (1989), named for a southern Minnesota town. Here were wistful laments and wry toe-tappers–an unabashed “country” sound that nevertheless strained in a new direction. As on the first, self-titled CD, Gary Louris’s reedy tenor merged with Olson’s baritone in down-home harmonies, while the mood swung between weariness and child-like wonder. Blue Earth at its best combines Midwestern charm with a lonely anguish rarely heard on the radio. Then came Hollywood Town Hall. The core of the band stayed the same – Olson and Louris on guitars and vocals, Marc Perlman on bass – as did the melodic songwriting and elusive, occasionally impenetrable lyrics. But a lot changed, beginning with a new label and new producer George Drakoulias. Where Blue Earth feels subdued – at times almost cramped – on even the most rollicking tunes, Hollywood Town Hall cavorts and cruises at an expansive new level. It’s a big, exuberant, confident sound, with booming drums, jangling guitars, and organ and piano in dense layers like church. As if to celebrate this breakthrough, the album offers do-overs of two Blue Earth songs, including a lusher version of the melancholy “Two Angels.” There are predictable photos of the band in a vintage car, and clowning over drinks in a restaurant booth – but there’s also a close-up of a Fuzz Face distortion pedal, serving notice that Louris’s electric guitar will be front-and-center and loud. Musically, Hollywood Town Hall embodies a broader, more spacious Midwest than that suggested by Blue Earth. The gentle southern Minnesota landscape flattens out to the endless straightaways and towering skies of Iowa, Kansas, Nebraska. On “Two Angels,” Louris continues in what critic Patrick Beach calls (admiringly) his “chicken-fried” guitar style, but he also plays with an assertive, incisive purpose, and this new boldness pervades the whole album. Hollywood Town Hall comes from a Midwest that is sprawling, unpredictable, and strange. After an opening blast of drums, guitar, and organ, the enigmatically named “Clouds” subsides into an easy canter. “God for the rich man ain’t the God for the poor,” Olson sings in a matter-of-fact voice. Some notoriously unintelligible lyrics follow, leading up to a hymnic refrain that soars on Louris’s tenor: “Can your diamonds talk to you?/ Can you see them shine?/ Keep them hiding in your room/ Can they guide you in your time?/ Can they guide you in your time?” The hortatory impulse rarely appears this bluntly, but it lurks throughout the album. 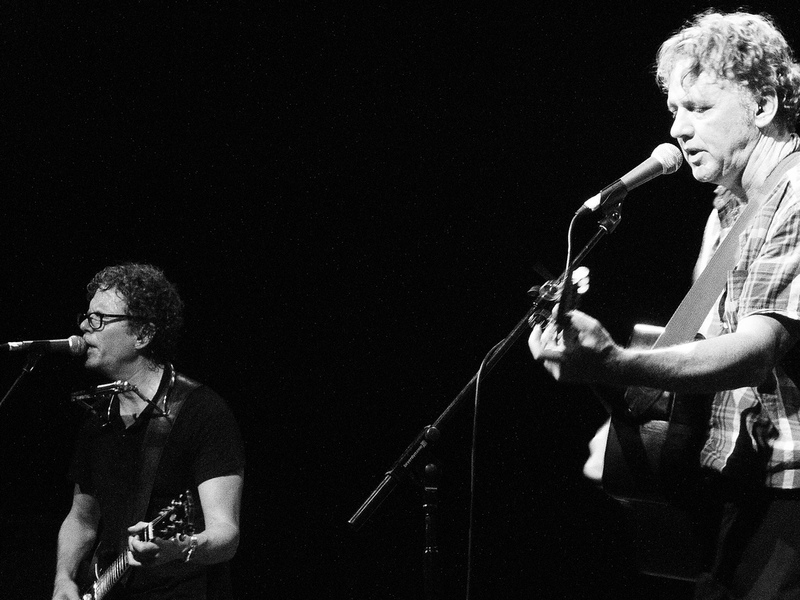 On Hollywood Town Hall, the Olson-Louris harmonies achieve such an uncanny oneness that sometimes the melody is anyone’s guess, and even the most opaque lyrics sound (almost) profound. (Three years later, “Ann Jane” from Tomorrow the Green Grass would test the limits of goofiness: “Beans and Jell-O I made ’em by myself,” the singers soulfully croon. Then they croon it again, a little more soulfully.) When Olson and Louris parted ways, as the great duos always do, fans looked back on the collaboration and dubbed it “the Univoice.” Hollywood Town Hall marked its apogee. In “Take Me With You (When You Go),” the vocals swoop from startling unison to a rumbling lower-register blend. The subtlest inflections, the slightest changes in dynamics mingle flawlessly, as if this wrenching emotion really were being endured by one person. Louris gives his Fuzz Face pedal a workout, getting the maximum expression from each screeching note and prolonged feedback spell. But the heart and soul of Hollywood Town Hall might come late in the album, on the searing “Wichita.” Here is a Midwest as surveyed by an Old Testament prophet dispensing curses and blessings – an “evil land” that “brings a devil’s cloud,” but also a land “where the fields are smiling.” “Wichita” begins with a deftly strummed acoustic guitar, then settles like “Clouds” into a familiar alt-country beat; but as Louris’s electric guitar slowly takes over and turns raucous, “Wichita” enters its own wild country, conjuring the menace and the beauty of wide-open spaces. If Gary Louris ever played the guitar this way again, I haven’t heard it. Nor has the Univoice displayed quite the same muscular bond. I think I first felt the Jayhawks’ almost mystical power while listening to “Wichita” on a stretch of interstate somewhere in Minnesota, Iowa, or Nebraska. At the end of a guitar solo a thin squeal of feedback materializes, carries for several measures, then changes into a sustained organ note. That line of feedback, like a speeding object on the prairie horizon, became for me the whole meaning of Hollywood Town Hall. Like a lot of people, I’d never heard of the Jayhawks before Tomorrow the Green Grass, the album that came after Hollywood Town Hall. “Blue” and “I’d Run Away” became minor radio hits, creating a sudden explosion of fans. It was only by listening backwards, as it were, that I discovered Blue Earth and Hollywood Town Hall, and gradually realized I didn’t care for Olson’s shrill vocals on Tomorrow the Green Grass, or a certain inconsistency in the songwriting. Then Olson left the band, to return for an album every now and then, or for a brief reunion with Louris. In 2009 the two released an excellent collaboration, Ready For The Flood, but things were never quite the same. Instead of fusing in a miraculous creative collision, their divergent natures simply diverged: Louris indulged his pop leanings, Olson went his odd cranky way. To tell the truth, I stopped paying much attention after a while. Earlier this summer, my wife and I took a road trip to central Illinois. We have another, slightly newer Focus now, with a CD player that actually ejects CDs. Coming home on I-80, as the terrain leveled off again in central Iowa, we listened, as we knew we eventually would, to Hollywood Town Hall. “Wichita” came on. Louris coaxed out that thin line of feedback. Olson picked up the vocal again, as if finding it in the rubble: “With my pockets torn/ By a whirlwind…” After a quarter-century, the music still surprises and moves me, still reveals to me the place where I live.